If you are a company seeking a team building adventure or looking to turn an exciting day of rafting into a day of valuable whitewater skills we can help with one of our team building rafting trips. Whitewater Excitement has been offering these type of events and we are accustom to handling groups of all sizes catering to the needs of your party. Whether you are expert rafters, beginners, or something in between, a trip on one of our rivers with us will promote teamwork and togetherness and will be just plain fun! 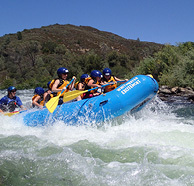 We offer river rafting trips on the South Fork, Middle Fork, and North Fork of the American River, along with whitewater river rafting trips on the and Merced River. Whitewater rafting trips are a great way to build trust, have fun, build team spirit, or be a reward for meeting goals. Most of our Corporate trips are done on the South Fork American river, as this is best suited for all types of folks, we even take non-swimmers. We offer 1/2 day to full day trips on all of our rivers, please give us a call and we can customize the trip to meet your specific needs. Did your group finish a project on time and do it well? Why not reward the team with a whitewater river rafting trip as a reward for all their hard work. This is a perfect time to get everyone together to take a deep breath, relax, and experience a super fun day of river rafting. We provide all the gear, food, and guides, all you need to do is show up and have a great time! Call our office at 1-800-750-2386 to discuss your team’s needs and desires. 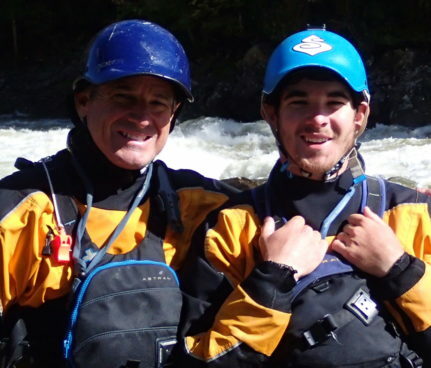 Our office staff can send you a complete quote on the river rafting trip you are interested in. For large groups we can arrange custom trips, time, catered meals at our private camp. Groups of 12 or more receive a 20% discount and 36 or more a 25% discount. Fun for families with children as young as 4. Waves are generally quite small; passages clear of any major obstacles. Great for beginners and Intermediate rafters. All ages groups 7 and up. 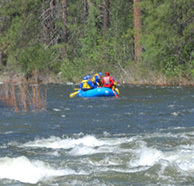 Rapids are longer, bigger, and more exciting but not difficult. Big runnable waves, swift current with obstacles easy to miss. Best for adventurous beginners and intermediate rafters who have swimming ability and are 12 or older. Rapids are longer, and markedly more powerful. Rafters are needed to paddle through large waves and holes. Or very athletic, adventurous first timers with swimming ability and 14 and over. Very long rapids; dangerous rocks and powerful waves and currents, precise and powerful maneuvering is required. Previous experience recommended. 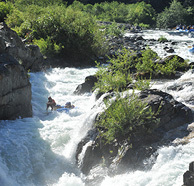 With previous class IV/IV+ experience looking for the ultimate whitewater challenge. Rivers and rapids that are only run by EXPERTS and then with great risk to their safety. Sign up! Keep up to date on what we are doing to give you the best river rafting experience, plus last minute deals and discounts! Are there photos taken of us?